Lately, many companies trying to go on the bandwagon of brain training have come out with all kinds of mental exercises and games either on the computer or as a video game that are supposedly improving brain function. Although mental activities in general can be useful and can be beneficial in overall exercising the brain, there is a big difference between SharperPrograms and such video or computer games. SharperBrain, has a patent pending technology that was designed and perfected at a cognitive rehabilitation clinic and not by software and marketing people as many of the programs in the market were. It improves specifically all aspects of cognitive abilities, including attention, focus, concentration, and a lot more. SharperMemory is a special program that works on all aspects of memory including working memory, short-term and long-term memory. One good way to notice the difference between SharperPrograms and basic brain training programs is to look at whether there is a specific list that describes which cognitive functions are improved. For instance, if you look at the list of cognitive skills that SharperBrain works on you will notice how detailed it is. Many so-called brain training and brain games are just referring generally about improvement of brain function. In addition, SharperPrograms have been successfully used to treat numerous conditions such as Attention Deficit Disorder, brain injury, strokes and cognitive disorders. They have been used for the past 5 years in our clinic to treat thousand of individuals successfully. In comparison, brain fitness games can perhaps generally augment some cognitive abilities but are not strong and sophisticated enough to actually treat the abovementioned conditions. SharperBrain works on improving brain self-regulation and improving brain waves, in addition to improving cognitive skills and abilities. No other brain training program in the market offers that. In summary, SharperPrograms are professional programs, clinically designed and tested. They provide serious results with guaranteed outcomes at a very affordable price. 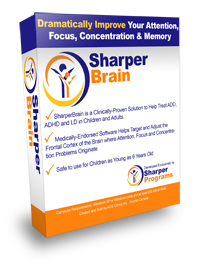 SharperBrain is a medically-endorsed software program that, when used for 20-30 minutes each day, is guaranteed to show a significant improvement in repairing the symptoms of ADD, ADHD and learning disabilities in children and adults. With results like these it's no wonder why parents, teachers, doctors and everyday people are praising SharperBrain as "the ADD and ADHD alternative treatment"
"Every Person with ADHD Should Use SharperBrain!" I now understand why you named your program Sharper Brain. That's exactly how my brain is feeling after using the program religiously for the last two months: very sharp!I believe that every person with ADHD should use it. After having to deal with this condition for almost 40 years, it is impossible to describe how it feels to be able to listen to people without cutting them off mid-sentence and being able to read an article in a magazine without skipping words, not to mention being able to retain all the information without the need to re-read it five times. SharperBrain is NOT a computer game - In fact, some computer games designed to help children with learning disabilities or attention problems can actually make those problems worse, with frantic "beat-the-clock" type games and puzzles. SharperBrain is fun and engaging and mimicks real-life situations where focus, attention and concentration are called for. The more you or your child practices, the more focused you become - varying between alertness, calm, concentration and relaxation. This is especially important for hyperactive children. You can start seeing results in weeks - not months or years! Compare that to a lifetime of medication and harmful side effects of ADD and ADHD drugs like Ritalin and Strattera. Your success with SharperBrain is unconditionally guaranteed or you pay nothing!